One of the many projects the AmeriCorps members have taken on locally this summer is the Virgil A. Lewis Memorial Reading Park on Brown Street in Mason. Pictured with Lowell Wilks, far left, project coordinator with Rivers to Ridges Heritage Trail, are AmeriCorps members Danielle O’Leary, Tia Burbach, Jonathan Kaiser, Emily Hodsdon, Jim Lee, Mishell Fields, Thiago Fernandes, and Amanda Ray, team leader. An AmeriCorps member is pictured as she paints the main stage at the Mason County Fairgrounds. The fairgrounds, West Virginia State Farm Museum, and the Virgil A. Lewis Memorial Reading Park are just a few of the local locations the group has worked this summer. MASON COUNTY — A group of young AmeriCorps workers from across the United States has been working diligently throughout Mason County recently on various projects and upgrades. AmeriCorps engages more than 75,000 members in service to nonprofits, schools, public agencies, and community groups each year, according to its website. In exchange for the year-long commitment, volunteers receive an education award for college, a living stipend, and training opportunities. Working in both Mason and Putnam counties until July 13, the local AmeriCorps group has been working through the Rivers to Ridges Heritage Trail program. Rivers to Ridges is a West Virginia scenic byway going from Nitro to Point Pleasant, with three excursion loops. The loops include the Mary Ingles Trail, the West Virginia State Farm Museum, and most recently, the Virgil A. Lewis Memorial Reading Park in Mason. Rivers to Ridges is led by Lowell Wilks, project coordinator, and Jim Flook, historian. Flook is an AmeriCorps VISTA member. 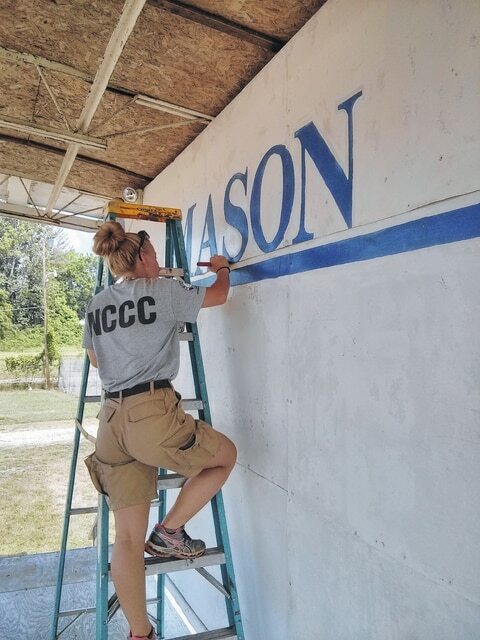 The AmeriCorps group recently painted the stage at the Mason County Fairgrounds, and has worked on the doctor’s office at the West Virginia State Farm Museum. One of the larger projects the young adults have been working on is at the new Virgil A. Lewis Memorial Reading Park. They have stained a shelter and trellis, planted grass, restored picnic tables, and erected signs. They will continue to work there until the park is open, and will be on hand during the ribbon cutting ceremony on Friday, July 10 at 11 a.m.
Made up of a team leader and seven members, the group working locally includes Amanda Ray, leader, of Kansas; Tia Burbach of Washington; Danielle O’Leary of New York; Jonathan Kaiser of Texas; Emily Hodsdon of New Hampshire; Jim Lee of Massachusetts; Mishell Fields of New York; and Thiago Fernandes of New Hampshire. While the group works with an organization during the week, they do independent projects on weekends. Animal shelters and rescues are among the favorite weekend projects. They have also completed four large projects in Putnam County. Traveling since March, the local group will graduate from the AmeriCorps program in November. After their stint in West Virginia, the group will head to Mississippi and Kentucky.